For more than twenty years we have relied on very special test benches to develop our products. Confidence and trust is something you only earn over a period of years. It's a necessity to deliver to promises, it's a requirement to exceed expectations. 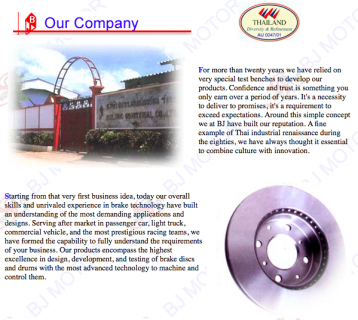 Around this simple concept we at BJ have built our reputation. A fine example of Thai industrial renaissance during the eighties, we have always thought it essential to combine culture with innovation.Starting from that very first business idea, today our overall skills and unrivaled experience in brake technology have built an understanding of the most demanding applications and designs. Serving after market in passenger car, light truck, commercial vehicle, and the most prestigious racing teams, we have formed the capability to fully understand the requirements of your business. Our products encompass the highest excellence in design, development, and testing of brake discs and drums with the most advanced technology to machine and control them. For more than twenty years we have relied on very special test benches to develop our products. Confidence and trust is something you only earn over a period of years. It's a necessity to deliver to promises, it's a requirement to exceed expectations. Around this simple concept we at BJ have built our reputation. A fine example of Thai industrial renaissance during the eighties, we have always thought it essential to combine culture with innovation.